Made with Organically Grown Grapes is created in the classic Korbel style, crisp, delicate and bright. We always strive to present the pure flavors of the grape in all of our champagnes. Schramsberg's very special J. Schram bottlings inevitably make their ways to the head of the class every year, and this newest effort is nothing less than an absolute tour de force. Sparkling wines produced in the United States can be made in both the méthode champenoise and the charmat method. Lower cost sparklers, such as André, Cook's, and Tott's, often employ the latter method with more premium sparkling wines utilizing the former. The history of producing quality sparkling wine in California can be traced to the Sonoma Valley where, in 1892, the Korbel brothers (emigrated from Bohemia in 1852) began producing sparkling wine according to the méthode champenoise. The first wines produced were made from Riesling, Muscatel, Traminer and Chasselas grapes. Partly aided by the foreign influence, the overall quality of Californian sparklers increased with the introduction of the more traditional sparkling wine grapes of Chardonnay, Pinot noir, Pinot Meunier and Pinot blanc into the production. US AVA requirements and wine laws do not regulate the sugar levels and sweetness of wine though most producers tend to follow European standards with Brut wine having less than 1.5% sugar up to Doux having more than 5%. As the sparkling wine industry in California grew, foreign investments from some of the Champagne region's most noted Champagne houses came to set up wineries in the area. 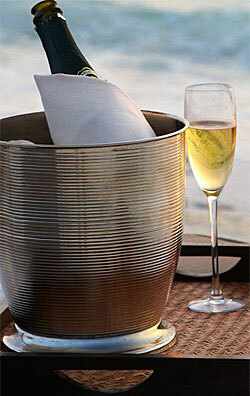 These include Moët et Chandon's Domaine Chandon, Louis Roederer's Roederer Estate, and Taittinger's Domaine Carneros. A recently developed, popular category of sparkling wine is sparkling ice wine, first created accidentally in 1988, by Canadian wine writer, Konrad Ejbich, in his home cellar. Vintage dated each year, the Domaine Carneros Brut Cuvée represents the best of Carneros pinot noir and chardonnay made into a classic sparkling wine. A perfect sipping wine, ideally paired with briny hors d'oeuvres such as smoked salmon on potato cakes, fresh oysters with mignonette or shrimp remoulade.